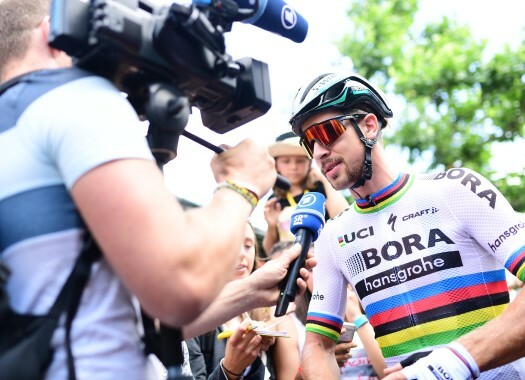 Peter Sagan (Bora-hansgrohe) hasn't recovered completely from the crash he suffered at the Tour de France and the pain forced him to withdraw from the road race at the European Championships. The World Champion retired just before the start of the 18th stage of the Tour de France after a crash caused him "heavy abrasions and bruises on his right side," reported the team at the time. Today, the Slovak was returning to racing at the European Championships, but he wasn't feeling optimal and had to withdraw. "The UEC – Union Européenne de Cyclisme European Championship is a race I was really looking forward to," said the rider in his website. "Despite the fact I still had a lot of pain in my back and hip, I tried and gave my best today. But, I wasn’t in good shape, and, unfortunately, after 150km of racing, I felt it would be best if I stopped, as it was becoming hard. "It was a good training for the coming weeks but I still need to fully recover from my hard crash at Le Tour de France, for the final part of the season. I’d like to thank the Slovak Cycling Federation, its staff, and all my teammates for their work today."